Shockingly funny and often simply shocking; an exquisite political farce from the genre’s master. For some improbable, inexplicable, totally batty reason the public’s interest in communism appears to be on the rise again. Or maybe it’s socialism, resistance, whatever…call it what you like, the appeal of this wretched and despicable institution continues to hold sway with a certain element that, deep down, craves the utopian dream of mandated equality and the erasure of socioeconomic distinctions. Complete horseplop fantasy, of course, and yet the delusion persists. With The Death of Stalin director Armando Iannucci (The Thick of It, Veep) adapts Fabien Nury/Thierry Robin’s graphic novel in his familiar style of hyperkinetic verbiage and scathing satire. The move from TV to cinema allows a sizable bump in graphic violence, yet it’s the rancid political ideologies on display that remain the most offensive. In a time when Hollywood’s obsession with Trump is fast-approaching pathological levels of insecurity, how nice to see the genre’s most astute storyteller at the height of his powers working with actual material that deserves a good mocking. Estimates for those who perished under Stalin’s rule range anywhere from 3 to 50 million, depending on the source you believe. Tragedies and statistics, goes the famous adage often (mis)attributed to the man himself, and it’s between the folds of reality and perception where Iannucci’s film plays. Farce over fact – though who can tell? After initially protesting, pianist Maria Yudina (Olga Kurylenko) insists on including a note castigating the Dear Leader with the recording – a show of “unauthorized narcissism“. This simple act triggers events that lead to the cerebral hemorrhage and eventual death of Stalin, though not before leaving the regime in utter disarray. Incredibly, the above nonsense is based on actual events, mostly. Stalin’s death opens a power vacuum where cabinet members devolve from chest-bumping sycophants to concealed hostility towards one another: whom to trust when nobody possesses the late Stalin’s native grasp of tight-fisted control (how ironic a leader who disparaged factionalism would find himself the namesake of a particularly odious strand). Somewhere between the paranoia a secret rivalry develops between NKVD head Lavrentiy Beria (Simon Russell Beale) and 1st Secretary Nikita Khrushchev (Steve Buscemi), each vying for control of the party and Russia itself. Does it matter that none of the principles resemble their namesakes? Or that the mixed UK/US cast doesn’t seem concerned with mismatched accents (including Adrian McLoughlin playing a Cockneyed Joseph Stalin)? Not at all, as the film’s unorthodox casting is brilliantly realized, perhaps none more so than Steve Buscemi’s Khrushchev, whose familiar self-pitying is an ideal fit for the passive-aggressive reformer. There’s a certain prestige attached to martyrdom where death for a cause – even a bad one – is preferable to ridicule; deep down, nobody wants to be the fool. Such comedic resistance in the face of extremism was an instinct shared by the Marx Brothers, Chaplin, and even the Pythons. As does Iannucci: evil must be ridiculed, not vilified, lampooned to the breaking point. Iannucci hides most of Stalin’s most insidious realities behind artfully placed camera blurs and quick-cuts, though even he isn’t above satirizing the madness. Death lists – so many lists – are dispatched with the same nonchalant directives one might include with the dry cleaning, and good luck finding a doctor (“all the best doctors are in the gulag…or dead”). Also critical: during quick evacuations one must never forget to include the tomatoes with the silverware. 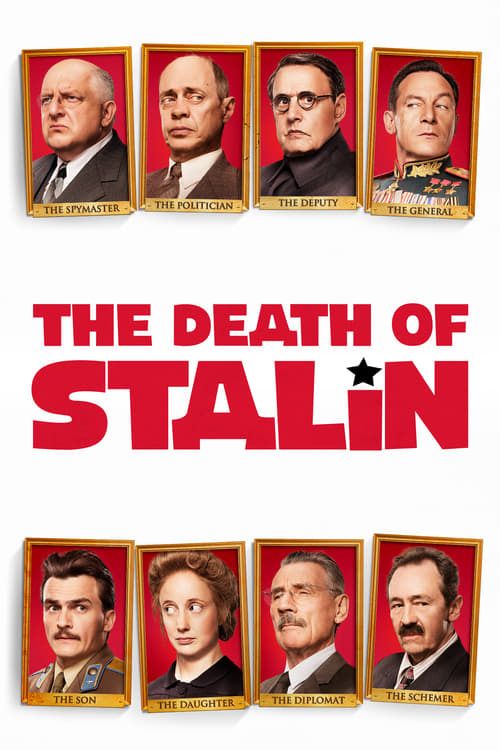 The Death of Stalin is both shockingly funny and often simply shocking, with Armando Iannucci once again proving to be cinema’s greatest skewer of political idiocy since the heyday of Monty Python, and certainly its most accessible. How refreshing to see genuine political satire still possible in this day and age of superficial hysteria. And yet, sometimes life imitates art imitating life: the end credits show photos of various members of Stalin’s cabinet being defaced, “erased” from existence. Just prior to the film’s American release the poster saw star Jeffrey Tambor’s image, without a trace of irony, Photoshopped away. Somewhere, Stalin is looking upward, pleased as punch.